Product prices and availability are accurate as of 2019-04-17 13:15:22 UTC and are subject to change. Any price and availability information displayed on http://www.amazon.com/ at the time of purchase will apply to the purchase of this product. The HP Proliant DL385 G7 is a 2U rackmount server utilizing up to two 12-core AMD Opteron processors for optimal computing power and density. HP ProLiant DL385 G7 servers are also designed with virtualization and flexibility in mind, and can be configured as a base, entry or performance system to fit various business demands. A total of 24 DIMM slots provide the DL385 G7 server with memory expansion options ranging from 64GB (using UDIMMs) all the way up to 512GB (using RDIMMs). The HP ProLiant DL385 G7 server offers two internal drive options: SFF SAS or SATA hard disk drive options can support up to 16 drives for up to 16TB of internal storage capacity, while the LFF SAS or SATA hard drive option supports 6 drives for up to 18TB of internal storage capacity. Targeting environments ranging from large corporate datacenters to small and medium-sized businesses (SMBs), HP ProLiant DL385 G7 servers are highly flexible, with broad operating system (OS) support a choice of 92% or 94% efficient power supplies and many other optional features. 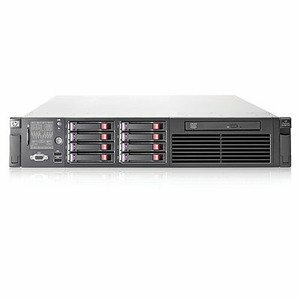 In addition to featuring an embedded HP Smart Array P410i controller, HP DL385 G7 rack servers come equipped with a 16MB cache memory, robust memory protection features including advanced Error Correcting Code (ECC) and online spare, hot-pluggable fans, and diverse intelligent manageability features. Just a few of the diverse management features offered by HP DL385 G7 servers include HP Insight Control, HP Thermal Logic, and HP Integrated Lights Out 3 (iLO 3).